Back in 1940, FDR considered helping save the European Jews by providing them with a new homeland in Alaska. It never happened, mostly due to the efforts of Anthony Diamond, who was at the time the Alaska Territory Delegate in the House of Representatives. 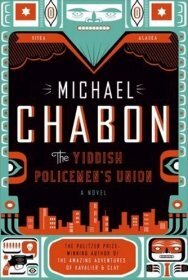 But in Michael Chabon’s novel, Mr. Diamond was killed in a car accident, and most European Jews were saved from death at the camps. And a good thing, too, because a bit east of Europe, the fledgling State of Israel lost its war of independence in 1948, and was destroyed. The Jews in Alaska speak Yiddish; Hebrew was mostly wiped out along with the State of Israel. And this teeming community of Yiddish-speaking Alaskan Jews provide the fascinating backdrop for this fascinating work of alternative-history fiction. It’s a rich Jewish community, with secular Jews and religious ones, ultra-orthodox Jews and Jewish criminals, not to mention ultra-orthodox Jewish criminals. The city of Sitka has its own Yiddish-speaking policemen, and one of them is detective Meyer Landsman. Detective Landsman belongs right alongside hardboiled detectives such as Sam Spade or Philip Marlowe (and anyone producing the film adaptation in anything other than film noir format is clearly out of touch with reality). Landsman is afraid of the dark, but that doesn't stop him from peeking into the darkest corners of the local community as he investigates the seemingly random murder of one Emmanuel Lasker. Many things try to stop Landsman in his investigation---his bad luck, his ex-wife, even a certain Mr. Spade. But as he uncovers the importance of the case, he doesn't let anything stand in his way. When he loses his badge, he waves his Yiddish Policemen’s Union card as a somewhat pathetic source of authority. At times, he himself is pathetic. But he is human and highly believable, an excellent character in a highly recommended book. Most reviews I’ve read on this book focus on the esoteric and intriguing setting; don't let that confuse you, since the plot itself is sufficient to make the book a great read in its own right. I did not know you write book reviews - they are great, and especially this one. It is a great read. Besides the well-written plot, I loved this novel for two reasons: the language, with its Yiddish/English mixture, and the way the private life of the characters blends with the history. It is a truly American novel, in this sense.